Wrap the dental floss fairly closely over four fingers and secure it with a double knot. Hold it between four fingers on one hand and the thumb on your other hand. The dental floss is now stretched between the thumb of one hand and the index finger of the other. There is only a minimum gap between thumb and index finger, and this allows you to control the dental floss safely and easily without cutting heavily into the gum. The detailed instructions explain exactly how to make the knot and exactly how to clean your teeth. Dental floss is traditionally wound around your fingers. However, this is not only unpleasant for your fingers, but can be dangerous for your gums. The loop method enables you to eliminate this risk almost entirely. 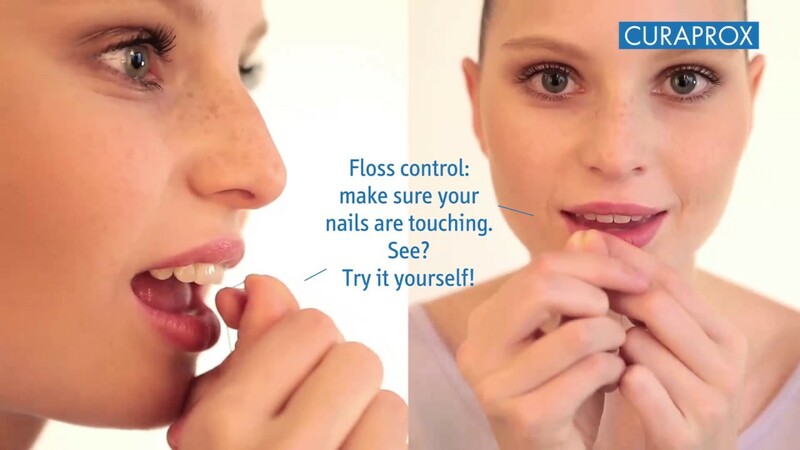 It gives you full control over the dental floss without cutting into the fingers. Take a piece of dental floss – the waxed sort is best – about 50 cm long. Put the two ends together and knot them. The goal is to make a loop that will go fairly closely over four fingers. The dental floss is now placed over the thumb on one hand and the index finger of the other. With only a minimum gap between your thumb and your index finger, you can control the dental floss safely and easily without cutting heavily into the gum. If the loop is too large, it is difficult to control the dental floss. Make a double knot: Take the ends of the dental floss through the loop twice and not just once. With a double knot: the knot stays where it is. Guide the dental floss over each contact point with short horizontal movements (these are the points where two teeth touch each other). Using the loop method, this is very easy to do and needs hardly any pressure – which means there is little risk of the dental floss cutting into your gum. Position your thumb and index finger so that there is as much dental floss as possible round a tooth. This enables you to enlarge the surface being cleaned. Guide the dental floss carefully two or three times up and down the surface of the tooth from the point of contact to the gumline (sulcus). Then transfer the dental floss to the other tooth and repeat the cleaning process there. Just like before, slide the dental floss out over the point of contact with short horizontal movements and move on to the next gap. Every mouth, every tooth and every gap, too. This means that optimum cleaning must be adjusted to suit a person’s individual anatomy, age and abilities. Get advice from experts on how to do it. Perfect, gentle and effective teeth cleaning is not something you can learn just by reading about it. Have your cleaning methods checked regularly by a dental professional who will tell you precisely which gaps need cleaning with dental floss and which gaps are best cleaned with interdental brushes.